The 10-year smoke sensor with indoor siren sets new safety standards in your home.There are a lot of potential fire sources in your own four walls, for example open fire such as candles or a fireplace. Also an iron, cooking utensils or numerous other electrical device can cause fire. 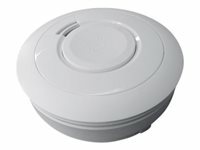 Smoke detectors can save lives! In case of a fire or smoke emission every second counts giving the chance to extinguish the fire or to get somebody or yourself out of harm's way. The Z-Wave smoke detector detects resulting fire and smoke emission reliable.Thanks to Z-Wave wireless technology you can define further actions triggered by the smart home control center in case of an alarm. To enhance safety, escape routes can be secured with automated lighting and unlocking or locking of shutters and doors. Z-Wave smart home buys time for you to get somebody or yourself out of harm's way.